By Dan Ambrose: Unbeaten #8 WBA welterweight contender Errol Spence Jr. (17-0, 14 KOs) has a big chance to prove what he can do in his fight next month against #8 IBF Chris Van Heerden (23-1-1, 12 KOs) on September 11th on the Adonis Stevenson vs. Tommy Karpency card on Premier Boxing Champions from the Ricoh Coliseum, in Toronto, Ontario. Spence, 25, was hoping to get a world title shot against WBC “regular” welterweight champion Keith “One Time” Thurman, but he didn’t have any interest in facing Spence despite the fact that Spence had Floyd Mayweather Jr. and Mayweather Promotions CEO Leonard Ellerbe asking Thurman in his behalf. Even with a potential fight against Mayweather, Thurman still chose not to fight Spence. It wasn’t a given that Mayweather would have fought Thurman, but when the man asks you to fight someone, it’s important that you follow his instructions because it could lead to a big money fight against him. At the very least, Thurman would have had the potential to fight for another world title because Mayweather was going to offer up one of his titles for the fight. A lot of boxing fans see Spence as the replacement for Mayweathger and Manny [Pacquiao after they retire from the game. As soon as they’re gone, Spence will be able to move in and look to fill that void. Hopefully, Spence doesn’t find himself avoided by the likes of Brook, Thurman and Bradley, but that’s going to be the case. Spence will likely need to wait until 2017 before he get a crack at one of the world titles at 147, and that’ll largely depend on how well the sanctioning bodies – IBF, WBA.WBC and WBO – rank him. As of now, Spence is ranked #8 by the World Boxing Association. It’s troubling that Spence isn’t ranked in the top 15 by the other sanctioning bodies because that would increase his chances of getting a world title fight. If the WBA decides they want to take their time in giving Spence a good rating, then it’s going to take him a long, long time before he gets a world title shot. Van Heerden is a good contender with wins over the likes of Ramon Ayala May, Ray Narh, Cosme Rivera, Hatton, Sebastian Andres Lujan, and Kaizer Mabuza. Van Heerden has beaten a number of top level fighters in the past, and he’s proven himself to be a good contender in the 147lb division. His only loss was to Nikola Stevanovic back in 2010 in losing a close 12 round decision. The fight could have gone either way, and you can make an argument that Van Heerden could have easily won the fight. 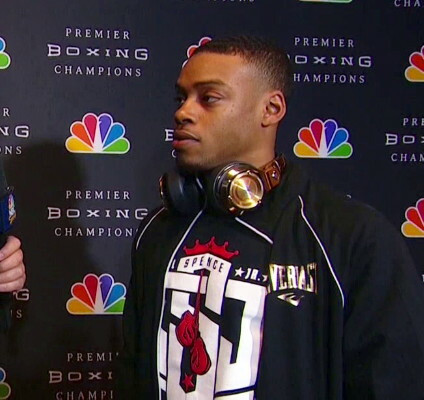 Spence, a 2012 U.S Olympian, has wins over Phil Lo Greco, Samuel Vargas, Noe Balanos, Javier Castro, and Ronald Cruz. Spence doesn’t have much in the way of experience, but he’s certainly ready to start taking on better contenders. If he can get a world title shot against Thurman, Tim Bradley or Kell Brook, I thin, he would take the fight in a heartbeat. But the only problem is we’re probably not going to see guys like Thurman, Brook or Bradley accepting a fight against Spence in this lifetime. Spence is the type of fighter who doesn’t get selected for voluntary defenses by champions. Spence is the type of fighter who only gets a crack at world titles when he’s the mandatory challenger, and even then I can see Spence having to wait a long time before he finally gets a shot at a title. The negative about Spence being on the Stevenson-Karpency fight card is that Spence is likely not going to be seen by a lot of boxing fans, because I don’t expect too many fans being eager to see a terrible mismatch between Stevenson and Karpency. That’s a fight a fight that is more of an ESPN level fight in my view. I don’t see it as the type of match-up that boxing fans will set aside time in order to see it. Unless you like mismatches, you’re probably not going to want to see the fight. That means that a lot of boxing fans won’t be seeing Spence’s fight against Van Heerden, because if they’re not going to bother watching the Stevenson-Karpency fight then they won’t be able to see Spence do his thing against Van Heerden.